"I know he's frustrated," Blackwater founder Prince said of the president. "He gave the Pentagon what they wanted. And they haven't delivered." WASHINGTON — President Donald Trump is increasingly venting frustration to his national security team about the U.S. strategy in Afghanistan and showing renewed interest in a proposal by Blackwater founder Erik Prince to privatize the war, current and former senior administration officials said. Prince's idea, which first surfaced last year during the president's Afghanistan strategy review, envisions replacing troops with private military contractors who would work for a special U.S. envoy for the war who would report directly to the president. It has raised ethical and security concerns among senior military officials, key lawmakers and members of Trump's national security team. A year after Trump's strategy announcement, his advisers are worried his impatience with the Afghanistan conflict will cause him to seriously consider proposals like Prince's or abruptly order a complete U.S. withdrawal, officials said. In an interview with NBC News, Prince said he believes Trump advisers who oppose his plan are painting "as rosy a picture as they can" of the situation on the ground, including that "peace is around the corner" with recent U.S. efforts for peace talks with the Taliban. He said he believes Trump's advisers "over-emphasize the fluff and flare of these so-called peace talks." Prince, a staunch Trump supporter whose sister is Education Secretary Betsy DeVos, argues that after 17 years of war in Afghanistan, it's time for the U.S. to try something new. "I know he's frustrated," Prince said of the president. "He gave the Pentagon what they wanted. ...And they haven't delivered." Prince said he hasn't spoken directly to Trump about the plan, but told NBC News he plans to launch an aggressive media "air campaign" in coming days to try to get the president to embrace it. His effort coincides with Tuesday's one-year anniversary of Trump announcing a strategy that increased the U.S. troop presence in Afghanistan. Trump approved the Pentagon recommendations reluctantly. "The strategy as announced a year ago was essentially just a dressed-up version of the status quo," said Jarrett Blanc, a senior fellow at the Carnegie Endowment for International Peace who served as a special representative on Afghanistan and Pakistan at the State Department during the Obama administration. A spokesperson for the National Security Council said Trump is committed to the current strategy he signed off on after months of deliberations. 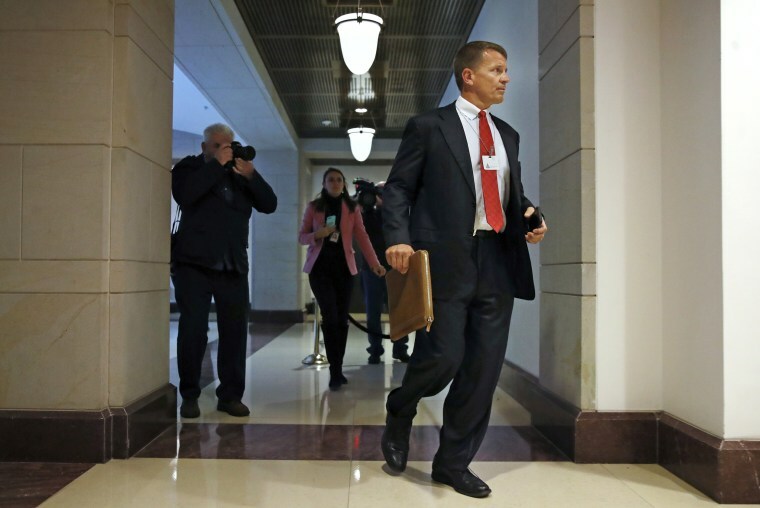 "No such proposal from Erik Prince is under consideration," the spokesperson said. "The president, like most Americans, would like to see more progress in Afghanistan. However, he also recognizes that withdrawing precipitously from Afghanistan would lead to the re-emergence of terrorist safe havens, putting American national security and lives in danger." In recent briefings with Trump, the president's advisers have emphasized the possibility of a political resolution with the Taliban and downplay the lack of military advances, officials said. "The president hears about Afghan military and political progress and the possibility of reconciliation during his briefings, but he rarely gets the full picture of security on the ground," said one senior U.S. official who has seen the briefing materials. The NSC spokesperson said, however, that the president is briefed regularly on Afghanistan, and "his briefs are comprehensive, covering both positive improvements and problematic actions." A defense official said the current U.S. strategy in Afghanistan might not show significant results until at least next summer, complicating efforts to convince the president to stick with it. "The current effort will show results, but it could be another year or more before the new advising mission makes a real, widespread difference on the ground," the official said. Trump's renewed interest in privatization was stoked by a recent video shot by Prince, according to a senior administration official, in which Prince argues that deploying private contractors instead of U.S. troops, and using limited government resources, would save the U.S. money. The White House currently has no plans for a comprehensive Afghanistan policy review, officials said. While one could take place after a new U.S. military commander of the war takes over in coming weeks, some officials said the president's team has been reluctant to conduct one now out of concern about what the president will decide. Prince said he hopes to speak in coming days with some officials on the National Security Council about his proposal. He said that while last year he discussed it with Defense Secretary James Mattis and Secretary of State Mike Pompeo when Pompeo was CIA director, he has not spoken to John Bolton, who become Trump's third national security adviser in April. The defense official said Prince's idea hasn't made its way to the Pentagon for official consideration yet, but it could quickly become a real option if Trump pushes for it. Mattis and Pompeo both oppose Prince's plan, officials said. A senior State Department official said there's "not a chance" it will be adopted. Asked for Bolton's view of Prince's idea, the NSC spokesperson declined to comment. In an interview with NBC’s Andrea Mitchell Friday on MSNBC, Prince said his plan was not privatization, “not a private army. It is a very clear delineation of who’s in charge, okay? The Afghan government working for a U.S. government official, funded by the United States at a fraction of a fraction of the cost of what we’re spending now.” Prince said his plan would save the U.S. more than $50 billion. The security situation in Afghanistan has worsened in the year since Trump signed off on the current strategy, and there are increased concerns about government stability and corruption in Kabul. The Taliban continues to make gains, while the U.S. has renewed efforts for peace talks with the militant group. As NBC News reported in August 2017, before approving the plan the president complained to his advisers that the U.S. was losing the war and suggested firing Gen. John Nicholson, the U.S. commander in Afghanistan. When Trump announced the current strategy, he noted that his "original instinct was to pull out, and historically I like following my instincts." But he said he'd decided to listen to his advisers to pursue an "honorable and enduring outcome" to the war. The U.S. currently has about 15,000 troops in Afghanistan. White House press secretary Sarah Huckabee Sanders said Wednesday that the president is "committed to finding a political solution to end the conflict in Afghanistan." Blackwater exec. denies Russian collusion in Trump admin. "As always, we're going to continue to review and look at the best ways to move forward," Sanders said. Lately Trump has pressed his advisers about Afghanistan progress on a weekly basis in Cabinet meetings and national security briefings, officials said. As he's grown frustrated, Trump has leaned on Pompeo, the member of his national security team who is closest to him. Pompeo traveled to Afghanistan last month for a trip the administration said was designed to advance the current U.S. strategy. Prince was not an official adviser to the Trump campaign but donated $250,000 to pro-Trump causes during the campaign and met with members of Trump's national security team during the transition. The Washington Post reported that special counsel Robert Mueller is looking into whether Prince tried to establish a backchannel between Russia and the Trump administration during a meeting with a Putin associate in the Seychelles in 2017. When Prince's plan had Trump's attention in 2017, it had the backing of his former strategist Steve Bannon and the president's son-in-law and senior adviser, Jared Kushner. The plan appealed to Trump because of the promise that it would be less expensive and put fewer American troops at risk than the current U.S. strategy. It calls for private contractors and aircraft to aid Afghan forces, with some help from the CIA and the Pentagon's special operations forces — all of whom would be overseen by a U.S. government envoy for Afghanistan policy who reports directly to the president and is given the authority to coordinate with the Afghan government. Prince believes Trump's frustration now could provide a path for the privatization idea. Trump also has shown more of a willingness follow his instincts on foreign policy since reshuffling his national security team earlier this year to replace former National Security Adviser H.R. McMaster and former Secretary of State Rex Tillerson — both of whom opposed Prince's plan. A former senior administration official said while the U.S. has relied on foreign governments to help pay for military conflicts, it would be new to ask those countries to pay private security companies directly. Prince's close ties to the United Arab Emirates, as well as the record of Blackwater, most notably in Iraq, would likely raise strong objections among administration officials and members of Congress. In 2007, Blackwater security contractors escorting a U.S. embassy convoy killed 17 civilians in Baghdad's Nisour Square. One employee was convicted of first-degree murder and three were convicted of manslaughter, but their verdicts were overturned in 2017. The use of private security contractors in U.S. military conflicts has been controversial, including in Afghanistan. Former Afghan President Hamid Karzai curtailed the use of security contractors, a policy the current government would have to undo for a plan like the one proposed by Prince to be implemented. "It's a ridiculous idea. It would only make things worse, prolong the war, and cause more deaths," the former senior administration official said. Brian Katulis, a senior fellow at the left-leaning Center for American Progress, said privatization would make it harder for Congress and others to know what precisely is happening in the war. "It makes an already murky position murkier," Katulis said. "The cost savings is not worth the potential damage to oversight of U.S. national security."